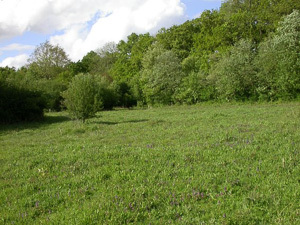 Bentley Station Meadow, Butterfly Conservation's reserve in the north-east of the county, consists of nine acres of ancient wet meadow, most of which had been overgrown with scrub. 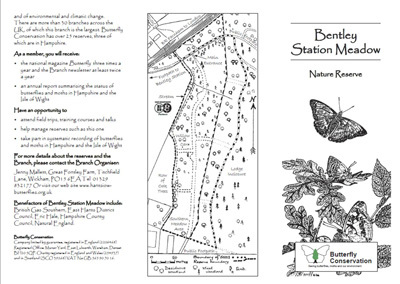 After purchasing the meadow in 1992, Butterfly Conservation carried out extensive clearance work. As a result the reserve now provides a diverse mixture of habitats with conditions suitable for both woodland and meadow butterflies. One section consists of oak woodland with some scrub. 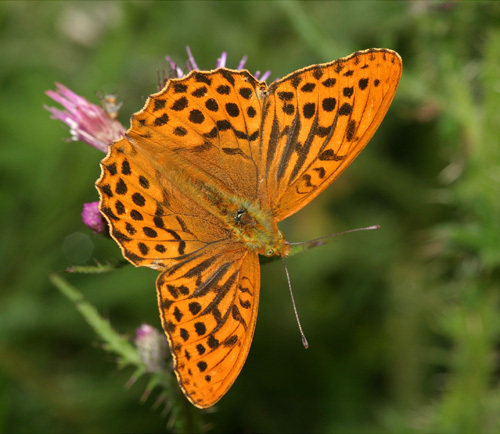 Conservation work has encouraged woodland flowers, especially violets and it is hoped that this will provide a breeding area for Silver-washed Fritillaries. 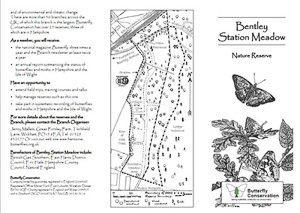 Buckthorns have been planted near the railway line fence to encourage Brimstone butterflies to breed. The main part of the reserve forms part of a Site of Special Scientific Interest (SSSI). At the entrance is an area of open meadow, fringed with mature blackthorn that help to create the warm sheltered environment that butterflies love. The many ant hills show that this is indeed an old meadow, which has escaped agricultural cultivation. Old natural damp meadows are rare to find and this one is in a superb location. Lying at the western edge of the Alice Holt Forest roe deer cross into it to graze. The reserve is important as a nectaring spot and breeding place for woodland butterflies, such as the White Admiral and the Silver-Washed Fritillary, and moths such as the Broad- bordered Bee Hawk moth. 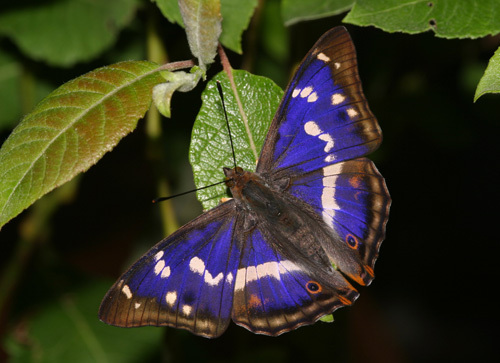 Many old sallows, larval food plant of the beautiful Purple Emperor, have been retained in the central part of the Reserve. 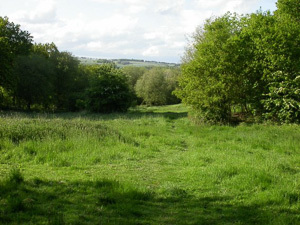 The southern part of the reserve has a large open meadow area with a range of taller grasses and nettles. The grasses are food plants for the Large & Small Skippers, Meadow Browns, Gatekeepers and Marbled Whites. The nettles are the important larval food plant for colourful butterflies like Peacocks, Small Tortoiseshells, Commas and Red Admirals. Some areas of nettles are cut in the summer months to generate new regrowth which is most attractive to egg laying females. 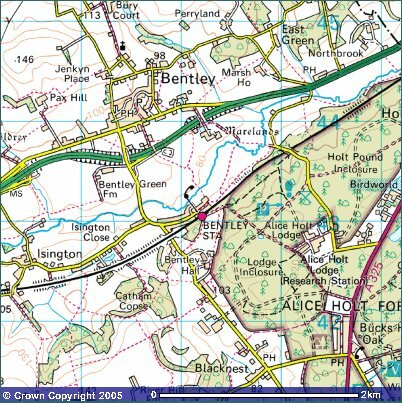 The cutting is done by butterfly enthusiasts in order to avoid cutting nettles that are already being utilised by caterpillars. 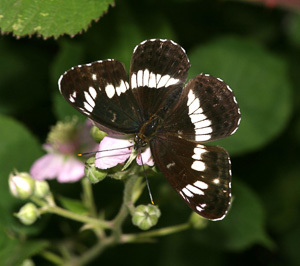 There are a number of log piles around the reserve to provide hibernation sites for butterflies that hibernate, like Peacocks. 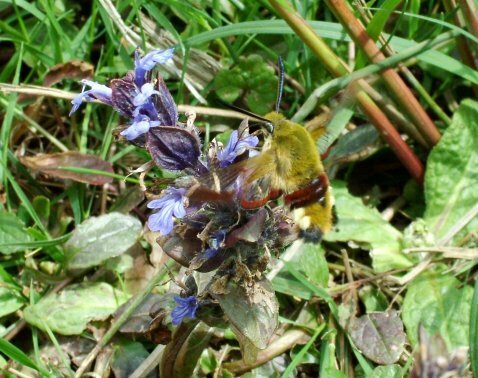 Flowers like bramble, devils bit scabious, wild angelica and wild mint are an important source of nectar. In order to maintain a diverse flora the reserve is grazed each autumn with cattle. There is also a small pond which serves as a breeding habitat for dragonflies such as the four-spotted chaser. Regular winter conservation work parties keep scrub in check. The bracken is cut regularly in the summer to reduce its density and so give an opportunity for violets to increase. Throughout the year a number of moth-ing sessions are organised to encourage people to come to see and appreciate the variety of moths that are present on the reserve. Most moths are nocturnal, so by far the greater numbers of species are attracted into light traps during the dark hours of the day that allow their safe capture and subsequent observation at close quarters, after which they are released. It is a great opportunity to photograph them before they are released, or soon afterwards. Funding from Natural England helps to support a programme of educational access to our reserves. Visits can be provided for both schools and adult groups. including leisure groups like photographic societies etc. 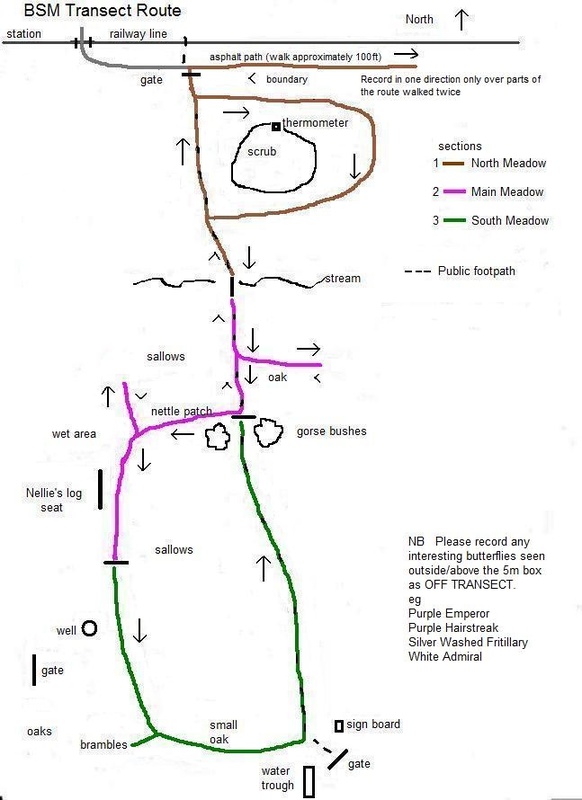 If you would like to know more about their management please contact our Reserves Officer, whose details can be found on the Committee page.